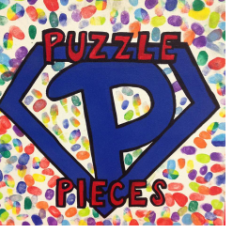 Welcome to Puzzle Pieces! - Welcome to Puzzle Pieces! We are an IRS 501(c)(3) non-profit located in Owensboro, KY. Our mission is to provide a safe environment for individuals with intellectual disabilities and promote independence, life skills, community access and involvement, social interaction, communication, self-worth and build trusting relationships between clients, staff, and families. Through our programs, we meet the individual needs of the clients we serve with a person-centered approach while incorporating a social atmosphere with opportunities to access the community. Puzzle Pieces, Inc is a 501(c)(3) non-profit organization and all donations are tax deductible. Find out how you can help by clicking the DONATE button below. Thank you! Thank you Owensboro and Messenger-Inquirer! Have you seen our "Shake those Hurtful words off, use Better choice words" Video? Here it is!! Click here to read the wonderful article about our Executive Director Amanda Owen in the Greater Owensboro Business Magazine - First Quarter 2013.